Repairing or tweaking an Internet connection can be quite the troublesome experience sometimes. It may take a long time before you resolve the problem or find the setting that normalizes your Internet connection speed. And while you normally cannot get more out of the line than you have subscribed to, you can make sure to get the most out of the connection whenever you connect to the Internet. 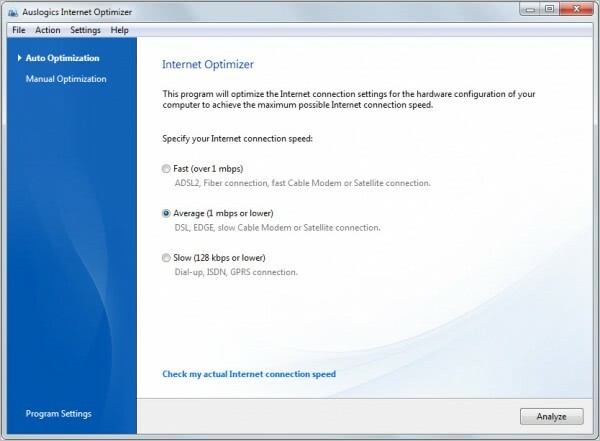 Auslogics Internet Optimizer is a free tool that tweaks several system and application specific settings to improve the speed and reliability of the Internet connection. Before you use it to tweak your connection, you should consider running speed tests to see if there is room for improvement. See the articles Internet Connection Speed Analysis, Internet Connection Reliability Test and the Speedtest review for programs that can aid you with the task. The program, that is also part of Auslogics' commercial performance software BoostSpeed, offers two modes of operation. Inexperienced users can let the program handle all the optimizations by simply selecting an Internet connection speed from the list. Available for selection are Slow (128 kbps or lower), Average (1 mbps or lower) or Fast (over 1 mbps). The program optimizes the system and applications for the selected speed in this case. The manual atomization mode reveals all settings and values the program can make changes to. The Internet Optimizer displays the most important settings at the top, followed by detailed global and application specific parameter listings. 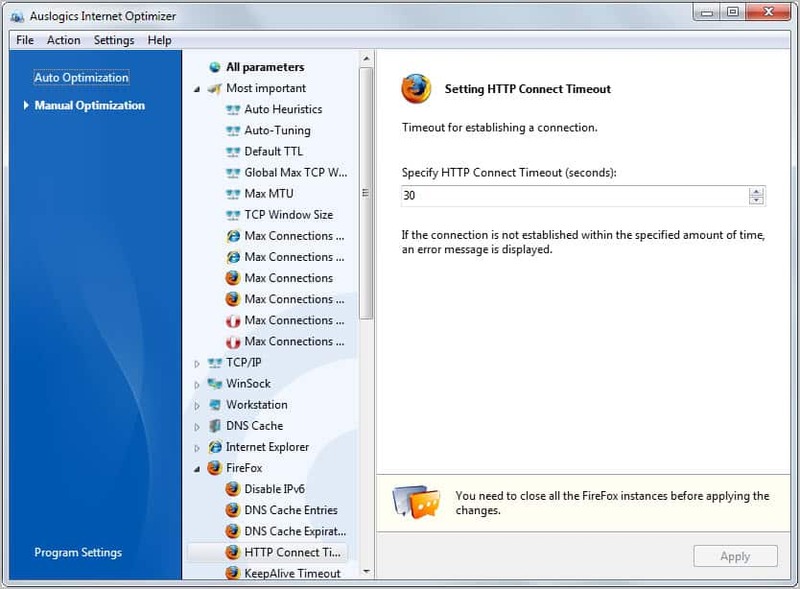 Internet Explorer, Firefox or Opera users can for instance change the number of total and per server connections easily. A click on a browser listing opens roughly ten parameters that can be modified to speed up the Internet connection. This includes disabling prefeteching or IPv6 in Firefox, the network buffer size in Opera or enabling TCP Autotuning in Microsoft's Internet Explorer. Most parameters are listed with descriptions that aid the user in the configuration. Inexperienced users will however have difficulties picking the optimal value for their Internet connection. Auslogics' Internet Optimizer is a useful program for users who experience Internet connection speed or reliability issues. Automatic and manual modes make the program interesting for users of all experience levels. A comparable program is TCP Optimizer. Not too sure if this program, as well as others that “claim” to boost your Internet speed really work or are nothing more than snake oil, although it could be helpful to those who’s TCP/IP is not configured properly! Those programs are not necessarily designed for users who do not experience any issues with their connection. You could use them to tweak the connection limit if you have not done so already to speed up downloads in web browsers. I personally find those programs more attractive than having to use the Registry Editor to find the settings that you need to change. Currently studying networking so i know what most of these tweaks do and they will definitely speed up TCP transfers and ARP. Martin your TCP Optimizer link also takes us to our friends @ Download Crew to the page for Auslogics Internet Optimizer. Kol, I have corrected the link, thanks for letting me know about it. I downloaded that little utility from speedguide.net. I set my connection, pressed ‘optimal’ and then ‘apply’. Speed tests are notorious for being a wildly innacurate test of your bandwidth, but after playing around in Firefox, I will say that some things feel a bit snappier, all of my Youtube buffering issues are gone, and some things do load faster. I did notice that since I’m using a 64-bit Nightly build of Firefox 12a1, this program didn’t pick that up and I wasn’t able to tweak any of the browser settings.